Hello Cycling fans, hope your having a great start to 2018. I would like to inform you on an entertaining event coming up on the 17th January 2018. 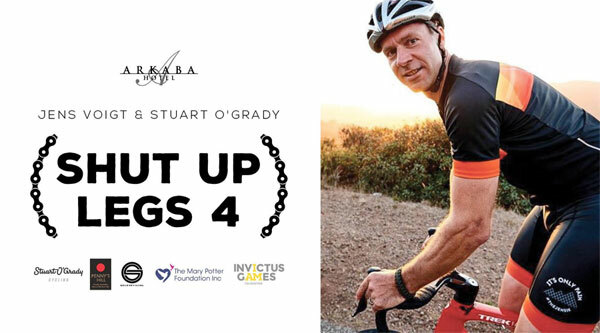 Starting at 7pm we present the 4th edition of the “Shut Up Legs” with Jens Voigt, hosted by myself, Stuart O’Grady at the Arkaba Hotel. Jens is world renowned for being a super tough cyclist & his motto, “Shut Up Legs” has been a global hit. Jens and I were team mates for 14 years, and share the World Record for Tour De France starts, racing 17 each. That's 34 laps of France (136,000kms) between us and approximately 1.5 million km's in their careers all up around the world. Between us we have won stages & worn the yellow jersey in the Tour De France, been a part of TDF winning teams and been involved in some major accidents... basically seen and experienced everything there is to see on a bike. We chat about our times together living in Europe and the ups & downs of those journeys, and will also be talking to special guests Mark Reid, the Invictus Games cycling coach along with a couple of the athletes that are going to Sydney in 2018 to compete in the games. This is a fun and informal night that will give you a real insight into the Cycling World with plenty of laughs. Jens is hilarious and we bounce of each other like brothers. Q & A will follow plus we will auction off a couple of items signed by Jens and Stuart..
★ TICKET PRICE INCLUDES - Cocktail food and 3 hour beverage package including Penny’s Hill wines, Pure Blonde, Carlton Draught, Bulmers, Pure Blonde Cider and soft drinks. Ticket price $99+ $3.50 booking fee.